The Japanese American National Museum, 100 N. Central Ave. in Little Tokyo, hosts a screening of “Searchlight Serenade” on Saturday, July 13, at 2 p.m. 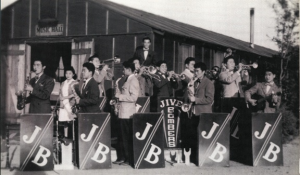 The Jive Bombers of Manzanar. “Searchlight Serenade” focuses on the proliferation of big bands in internment camps throughout the West during World War II. Nisei quickly organized dance bands when they were removed to the fairgrounds and racetracks that were converted into temporary detention centers, and reorganized them once they were moved to the more permanent camps in desolate areas of the country. In all, 20 bands were created with names like the D-Elevens, Stardusters, Jive Bombers and Music Makers. These bands thrived in 13 camps from 1942 to 1945. Swing music played a vital role as escape, as therapy, and as a connection to the outside American world. Playing and appreciating such a totally American art form was an aspect of their American identity that could not be denied within the confines of the camps or the denial of their civil rights. 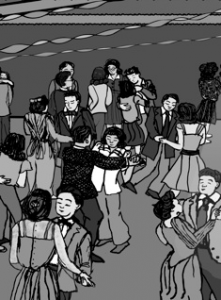 An animated sequence shows a dance in a camp mess hall. KEET-TV (Eureka) producers Claire Reynolds and Sam Greene collaborated with artist Amy Uyeki to tell the stories of former internees who played music in the camps through interviews and archival footage interspersed with segments of Uyeki’s 12-minute animated short. Created from original woodcuts and drawings, the animation is inspired by actual events and accounts of some of the musicians and singers she interviewed. 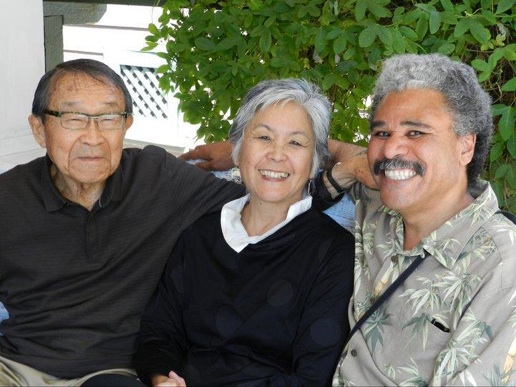 With help from advisor and musician George Yoshida, the “Searchlight” team was able to locate former band members in Los Angeles, the San Francisco Bay Area, Yuba City and Portland. The interviews with nine musicians and singers from the camps, many of whom are still performing, form the basis of this moving documentary, and their poignant stories and ebullient spirits remind viewers that art and music can be an incredible force of healing and positive energy in a difficult environment. The documentary’s advisors: George Yoshida, author of “Reminiscing in Swingtime” and founder of the J-Town Jazz Ensemble; filmmaker Satsuki Ina (“Children of the Camps,” “From a Silk Cocoon”); Anthony Brown, ethnomusicologist and founder of the Grammy-nominated Asian American Orchestra.